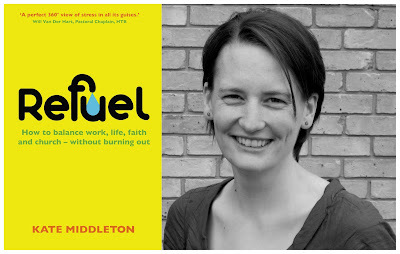 Welcome to the website accompanying my book Refuel: How to balance work, life, faith and church - without burning out. What this site is about is a whole host of extra resources which I have put together to help you think more, chat more and hopefully understand more about some of the topics I’ve raised in the book. You’ll find a whole host of things here - articles, videos, book recommendations - some serious, some more light hearted but all expanding the topics raised in the individual chapters of the book. The material is organised by chapter, so once you’ve read each one, you can look at what extra things there are that might interest you, open up themes in more depth or answer questions you might have in your mind. Of course, you can use these resources just for yourself, or they might be something you can chat about with others who have read the book. But I hope that these additional things will help you should you be looking to work through the book as part of a small group. Here you’ll find funny videos you can use to kick off a session, more in depth material should you want to take a topic deeper, and illustrations or ideas you can use with the whole group. Bear in mind that this site isn’t static - I’ll be adding things as I come across them. Its also a useful space where I can let you know about events and conferences which might interest you - things I am speaking at or events from some of the organisations I work with. I’ll also post links to articles and things I have written elsewhere on the web. If you want to be notified when there is something new to read here, sign up to receive the newsletter. Think that your perspective doesn’t influence your understanding and experience of stress? Watch this series of adverts (from American mortgage company Ameriquest) and think again! Ever experienced emotional hijack? Here’s a classic example of someone who has … for more about emotional hijack read this from Psychology today website..
Are you an introvert or an extravert? http://www.thepowerofintroverts.com/about-the-book/quiet-quiz-are-you-an-introvert/ or http://www.theguardian.com/science/quiz/2012/mar/13/quiz-are-you-an-introvert. Passion can be stressful - but it is also powerful - something we look for in others that influences how likely we are to be convinced by their argument. Check out this clever study looking at how one small change in how someone gave a speech changed the way they were able to influence an audience. Passion and frustration can be tools which God uses to help us meet our potential. For more about what God has to say about our potential check out this blog I wrote on the subject. Meanwhile guilt is a fascinating emotion - and one that many people have written about. Guilt is powerful and manipulative (here’s a great explanation of why, including how it can be such a powerful driver of what psychologists call ‘avoidant behaviour’) and has the power to make us push ourselves very hard (guilt is the emotion which drives us to work the hardest - which is why it can lead to an increased risk of stress and burnout). In fact guilt has even been demonstrated to affect your immune system. So is guilt always a bad thing? Are you feeling guilty about a heap of things you haven’t got round to doing yet today? Here’s a more positive perspective on guilt, based on the function it was originally designed to have, from the Guardian’s ‘change your life’ column - ‘How to make the most of your guilt’ - learn how planning a guilt hour might make you a whole lot more productive.